Who approved Army anti-Christian briefings? 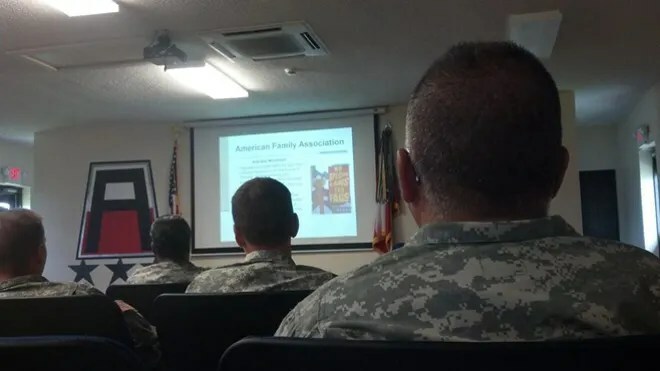 Thankfully, the Army has pulled pre-deployment briefing materials categorizing entities such as the American Family Association and the Family Research Council as extremist hate groups. But who approved those materials in the first place? An important key to help us understand. More reverse engineering of my life in Christ: which has taught me only to walk, and depend upon him alone. As many of you know who follow my blog, I started off in systematic theologies (church system) complete with theologies and Bible doctrines in helping my natural understanding of the relationship God provided man, through the atonement of his son who died on the cross for our sins. I obtained a leadership position within the church, and was the Chief of Chaplain’s assistant for the State for a season. However, because I was elect of God, and called to “his purpose” he has always insisted that I follow him and him alone. I also understand that the Bible was written for God’s people alone; whom God engineered for his elect, and for their repentance (SALVATION) in Christ, and their obedience to follow him as a disciple. Like Abraham, my heart has always sought my Lord’s direction within my life. I studied and worked for years under a minister who knew my Lord much better than I, and I hungered and thirsted for a greater understanding of the actual workings of the Lord in my life. The most important element of following Jesus Christ is elementary; which is to move and function of the spirit of truth within us, “if we truly know him”, and seek to move in obedience to his voice within us. A good Biblical understanding and theology is merely secondary to actually having and following our life in Christ. However, most “Christians” today operate independent of God’s leading either because they do not really know him, or they have chosen to move independent of his leading within their lives. The latter is referred to in the scripture as taking the broad road, as Jesus taught most would do! I have discovered within my life, that most of the people I have met who claim to be men of God, will not listen and move in obedience to his voice within them, yet they claim the name of Jesus Christ as their Lord and savior. Most move in independence of Christ personally, normally because of their natural understanding of the scriptures. Sometimes this comes from spiritual ignorance (immaturity), or worse, because of the pride of life, just like the Scribes and Pharisees did at the time of Christ. I have noticed within my life, that the hardest people to convince of this error are people who have a profound natural understanding of the scriptures, most often found in well established denominations within the world. This makes total sense, as these institutions are established by men and are set up, to move in independence from our Lord and his leading of his individuals, whom truly make up his body. The following is an example from my life experientially; as to help the reader understand just the kind of spiritual snare which has always been experienced, ever since Paul’s letters to the brethren in Galatians. Years after experiencing my “Pastoral Vision”, (which the Lord felt necessary to give me in order to build my faith in him), I would mistakenly share the experience after surpassing the leadership training for Deacons and Elders “in the Church leadership” at that time. You see, it was the Pastor of my Church who consistently discouraged me from moving into a “Pastoral type of position” within the institution. I could not understand as to why he would do such a thing, as it was quite obvious to me, that the Lord was doing a powerful work with in my life, and I believed what was written on the “denominational box” so to speak. When I attempted to try and share my experience privately at the end of my training, my knees became very weak, as the Holy Spirit poured over me like a “great waterfall” to the extent that I could not even hear the Pastor’s response to my testimonial. I now understand that this pouring out of the Holy Spirit, was for my protection, in safeguarding the faith in my heart from a wolf in sheep’s clothing; and what the Apostle John first termed as an “anti-Christ”: which is a (false or alternative to Christ) which is not normally taught to the brethren within the “Church establishment”. One of the other reasons I was not allowed to hear his response to my vision; is because it was in direct regards to the Pastor telling me that, he did not see me as a Pastor. This is an example of why it is written in 1 Corinthians 1:20-21:  Where is the one who is wise? Where is the scribe? Where is the debater of this age? Has not God made foolish the wisdom of the world? For since, in the wisdom of God, the world did not know God through wisdom, it pleased God through the folly of what we preach to save those who believe. If you will notice, this testimonial draws a direct connection between the Church in Galatians, and the Church in Corinth. In addition, a true Elder of the Lord will walk in obedience to building others up in Christ, through their spiritual knowledge of Jesus Christ’s sanctification within their own lives, and not just a dead head knowledge of the scriptures, but by the living waters that they allow to flow through them and revealed to their minds by the Holy Spirit in accordance with the scriptures. God does not work with mere men twisting his arm to fit into their doctrinal positions, he works with those who actually have and listen to him. I would like to add before closing: that the Lord quietly whispered to my heart (while passing outside my old Church in my car) “they will no longer endure sound doctrines”… straight out of 2 Timothy 4:3 – and if I might be so bold, the Lord does not normally quote a part of the scripture to me; unless to make an impression in which I might share with others. The reason he chose to speak to me in this manner: is not because the “letter” in the scriptures were quoted wrongly; but simply because the leadership refused to listen to our Lord’s leading within their lives, by the Holy Spirit’s prodding. This is why Jesus said to follow him as a disciple, and to not be conformed to the things of this world, nor love for the world, which also includes “doing religion about him”, loving your own life’s positioning, and even one’s family, above him. Filed under Christian informed values., Disciples of Jesus Christ. It’s Red October in America! The ruling class Democrats and their media have successfully “fundamentally change America”, just like they intended to do! And if you object, you are painted as an enemy of the State! Racism, sexism, homophobia, is the battle cry of these ruling class elitist’s, as they know all too well how to suppress, marginalize, and destroy the traditional American taxpayer, who would try and fight for individual responsibility, liberty, and personal choice. These elitists are why we are going broke; it is not their money which they earn by sacrifice, labor, sweat and even blood. Yet like all other ruling class tyrants, they have no problem in taking from the people who produce, to live in the lap of luxury. They provide bread and circuses to keep the ignorant masses pacified; who will continue to support and vote for them as they steal from the actual productive citizenry, just so they may maintain power for a season. Yet total economic collapse, and driving division and resentment in the people’s hearts, finally triggering a civil war to a society which can no longer afford such irresponsibility; which recorded history has always affirmed. The brilliance of the founding fathers was in designing a Constitutional system that would avoid, and even repair itself if need be, from those who would oppress others by tyrannical abuse of these powers while in office (as a representative of the people). The principles of limited government, having a separation of powers, thus secured the ideals of the free market, personal property and individual liberty by those willing and able to produce for the greater needs of others. Today most of the articles of the U.S. Constitution have been subverted by an elitist class and their media or are completely ignored. Filed under Christian informed values.